Though still under construction, the IceCube Neutrino Observatory at the South Pole is already delivering scientific results — including an early finding about a phenomenon the telescope was not even designed to study. However, one of the challenges of detecting these relatively rare particles is that the telescope is constantly bombarded by other particles, including many generated by cosmic rays interacting with the Earth’s atmosphere over the southern half of the sky. For most IceCube neutrino physicists these particles are simply background noise, but University of Wisconsin-Madison researchers Rasha Abbasi and Paolo Desiati, with collaborator Juan Carlos Díaz-Vélez, recognized an opportunity in the cosmic ray data. Abbasi saw an unusual pattern when she looked at a “skymap” of the relative intensity of cosmic rays directed toward the Earth’s Southern Hemisphere, with an excess of cosmic rays detected in one part of the sky and a deficit in another. A similar lopsidedness, called “anisotropy,” has been seen from the Northern Hemisphere by previous experiments, she says, but its source is still a mystery. “At the beginning, we didn’t know what to expect. To see this anisotropy extending to the Southern Hemisphere sky is an additional piece of the puzzle around this enigmatic effect — whether it’s due to the magnetic field surrounding us or to the effect of a nearby supernova remnant, we don’t know,” Abbasi says. The new result publishes Aug. 1 in The Astrophysical Journal Letters, published by the American Astronomical Society. One possible explanation for the irregular pattern is the remains of an exploded supernova, such as the relatively young nearby supernova remnant Vela, whose location corresponds to one of the cosmic ray hotspots in the anisotropy skymap. The pattern of cosmic rays also reveals more detail about the interstellar magnetic fields produced by moving gases of charged particles near Earth, which are difficult to study and poorly understood. Since nearly all cosmic signals are influenced by the interstellar magnetic fields, a better overall picture of these fields would aid a large range of physics and astronomy studies, she says, adding that their newly reported findings rule out some proposed theories about the source of the Northern Hemisphere anisotropy. The IceCube group is currently extending its analysis to improve its understanding of the anisotropy on a more detailed scale and delve further into its possible causes. While the newly published study used data collected in 2007 and 2008 from just 22 strings of optical detectors in the IceCube telescope, they are now analyzing data from 59 of the 79 strings that are in place to date. When completed in 2011, the National Science Foundation-supported telescope will fill a cubic kilometer of Antarctic ice with 86 strings containing more than 5,000 digital optical sensors. “This is exciting because this effect could be the ‘smoking gun’ for our long-sought understanding of the source of high-energy cosmic rays,” says Abbasi. The Vela SNR does make for a good candidate candidate given its age (11,000-12,000 yrs) and distance (~800 ly). In 1968 it was shown that the Vela Pulsar was indeed associated with the Vela SNR and moving at 1,200 km/s from its point of origin. It’s also the brightest persistent object in the high energy gamma ray sky. I’d be interested if any further connections between the Vela SNR and the observed anisotropy are to be made. Not that good, just one. How does this observation relate to the South Atlantic Anomaly? Anisotropies of this sort are disquieting. The Vela hypothesis is plausible. There might be some anisotropy in the solar system magnetiodyndrodynamic plasma shell, which over these distances can bend cosmic ray particles. Of course these are conjectures at this point — probably wrong. Very interesting! Serendipitous science anyone? The comment, “Since nearly all cosmic signals are influenced by the interstellar magnetic fields, a better overall picture of these fields would aid a large range of physics and astronomy studies…” speaks multitudes about what we don’t know! Somebody here is thinking of zebras, again! It’s common knowledge in the astronomical community that magnetic fields pervade interstellar space, and that they are notoriously difficult to study. This simple fact is light-years away from support for the claim that cosmology and the evolution of the universe is somehow dominated by electromagnetic effects. Of which energy regime are we speaking, or is it just roughly about “all” cosmic rays? Because this is critical for the strength of the influence of magnetic fields on cosmic rays, and if we can really correlate them with, say, the Vela SNR. I was asking much the same question to myself. However, I think or figured this is all cosmic rays with no discrimination or filtering with respect to energy, ICE CUBE is picking this up as background noise. The momentum-energy spectrum is important with regards to magnetic fields as an explanation of the anisotropy. Yet most cosmic rays are in the MeV range of energy and are fairly influenced by magnetic fields. This might be due to the solar system’s magnetic field anisotropy due to the interstellar boundary effect as measured by IBEX. 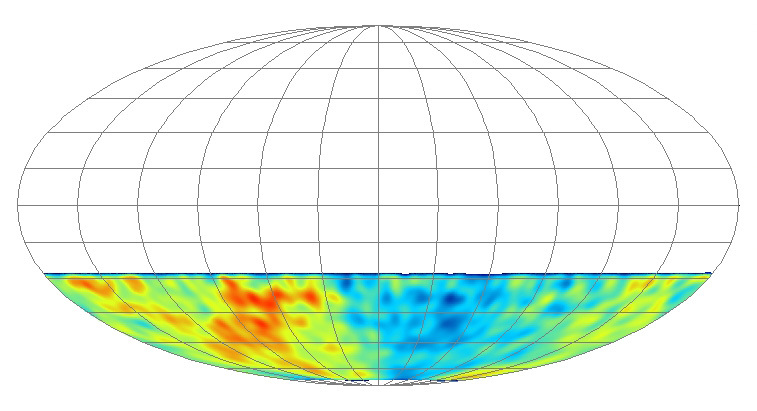 This field distribution might then filter an averaged cosmic ray background mostly at low energy. Some data correlation is needed to make a preliminary assessment. The identification with the Vela SNR suggests some coordinate correlation with that and this measured anisotropy. However, without numbers I can’t see how that identification is made. What if we considder that our Universe is an expanding bubble of EMF with turbulence. Can anybody tell me why this shouldn’t be the case ? Tony Trenton, I do not know what “an expanding bubble of EMF with turbulence” means; can you say more please? In any case, the vast majority of the cosmic rays detected will have come from sources within our own galaxy and/or the Sun (the ‘anomalous cosmic rays’), though without energy constraints, we can’t be 100% certain (as others have already mentioned). Vast majority? Something like 99.999999%, give or take a few 9’s. The universe is, of course, vastly bigger than just the Milky Way, so whatever the cosmic rays are telling us, it’s not anything about the universe as a whole (at least, not directly). Vastly bigger? A guess, off the top of my head, something like 99.999999% … anyone like to try to make it more precise? Hopefully we’ll find the data from both hemispheres lining up when they publish this next month. Both ideas have merit. The cosmic ray excess could come from difuse particle flows from Vela, or from the local interstellar magnetic field. Its possible it can come from anything from that part of the galaxy. Jean is correct, there is no true way of knowing yet. Likely we are only going to look at those coming from our own Galaxy. Likely using a median energy base of 20 TeV or so. Although our Universe is expanding, it isn’t an expanding ‘bubble’. Also, I don’t know what EMF is, and there is no evidence of turbulence I know of. Do you have a reference? I think the IBEX hypothesis looks bad. I looked at the mutual coordinates of the IBEX “ribbon” and where this data lies. There does not look to be much of an overlap with the ribbon and the regions of cosmic ray excess of deficit. Also the authors state the average primary energy of the cosmic rays is 20TeV. These are more relativistic than I was presuming they might be. Any change in the heliomagnetic field due to the motion through the galaxy, as found in the IBEX “ribbon” is not likely to account for much. This is roughly two orders of magnitude below the knee, implying a galactic origin. However, in these “low” energetic regimes, I think, it’s hard to trace any direct correlations. IIRC (but I don’t check it, now; it’s past midnight in Europe…), even the weak galactic magnetic field is enough to deflect them too much for any reasonable correlation. Still, slight anisotropies (btw: what is the “excess” above the average in the above picture?) should be reasonable. But one question: Which coordinates are shown in the picture? Are these galactic one, or what? If not, an excess in the direction of the galactic center would make sense to me, at least a little bit. How long a period are these data summed over? As Ivan sez about zebras, I’d like to see some evidence that this isn’t a diurnal effect of some sort. just read the paper Lawrence B. Crowell linked to. It is very informative and answers all your questions. To sum them up: The observational period was from June 2007 to March 2008, and, no, the earth’s rotation had nothing to do with it. Thanks for the link to the paper. It answers also the questions I had. They even talked about the gyro-radius, which is about 0.01 pc. This implies that the anisotropy has no heliospheric origin, but is still in our galactic neighborhood. It hints either at some irregularities in the galactic magnetic field, or at a nearby source, for which they used the Vela SNR as an example. However, I have no idea how “significant” the excess of 0.2% really is. It is there, but for me it does not imply “radical” changes in our understanding of cosmic rays or the magnetic fields. Still, thanks again for the paper. I came to a similar conclusion. This anisotropy appears to be due to a high energy particle spectra from the SNR bowshock physics. Most cosmic rays hitting earth come from outer space are not from the sun, and increase in numbers when the suns 11 year cycle is at a minimum. When the sun is most active the heliosphere expands, increasing the suns magnetic field which shields earth. The earth orbits the sun with its magnetic north and south poles always upside down relative to the suns N-S magnetic poles. The suns lethal southern hemisphere is always hidden from our view, ejecting plasma out coronal holes. Most cosmic rays are positively + charged particles, few are electrons -, so they should be more attracted bending towards the suns stronger negative north magnetic field especially during maximum solar activity i.e. flares, sunspots. It’s likely that the southern hemisphere of earth is always pointed towards the suns negative charged north magnetic pole causing the huge increase of cosmic rays hitting earths southern hemisphere especially near the south pole. Thanks for that link. It answered a few questions I had after reading some of the responses. JIMHENSON, what you write may apply to low(er) energy cosmic rays, but, AFAIK, the influence of solar system magnetic fields – the Sun’s, the Earth’s, etc – is undetectable for cosmic rays of the average energy of the ones this article is about (20 TeV, see earlier comments). The influence of the helio-magnetic field is not large for high energy cosmic rays above 100 Gev. By the Lorentz force the radius of a charged particle grows with velocity, and in a relativistic setting the radius continues to grow with the energy of a particle. Sorry, but for me it seems that what JimHenson wrote does not apply to anything but to this. my post here was my own totally original scientific analysis, I do not plagerize and am a degreed earth scientist who generally gets most facts correct. I do not expect to ever become a #3 co-author to a new scientific breakthrough mathematical equation, though am studying algebraic equations and black holes with wild hopes. reality, scientific ideas must be tested proved through guys like you here who do not adhere to the great scientific tenet of abandoning your beliefs noteably in dark energy and dark matter. All of you hate plasma physics as an explanation for gravity, when good recent evidence is of nearby Segue 1 Galaxy having just 1,000 outermost stars that orbit at same speeds around the SMBH, so the scientists suddenly say that it has to have more dark matter then any known galaxy! This violates the Copernican Principle, because a nearby tiny 1,000 star system just doesn’t fit reality for a discovery of the densest most compact dark matter galaxy even known to exist! Yes that was how it sounded. But there is something strange in his texts since these texts appear to have a lot more sense than the texts he wrote before.